NEW YORK (WABC) -- A new round of toll hikes took effect Sunday at the Port Authority crossings, including the George Washington Bridge, the Lincoln and Holland Tunnels, the Bayonne and Goethals Bridges, and the Outerbridge Crossing. 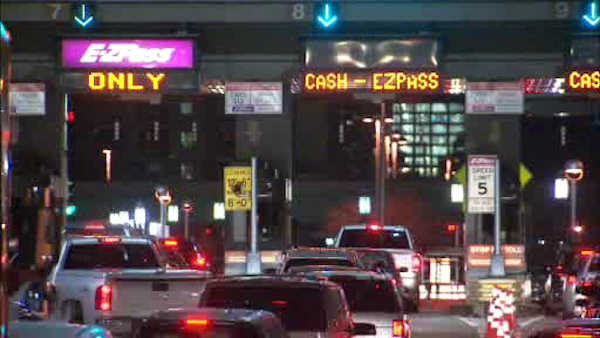 EZPass rates went up 75 cents, and cash tolls by a dollar. So E-ZPass customers will pay $10.50 during off-peak hours and $12.50 during peak hours. Cash customers will pay $15 at all times. When the toll hikes began, the E-ZPass rates were $7.50 and $9.50 for off-peak and peak hours, respectively. The new rates went into effect at 3 a.m. on Sunday. The toll hikes were approved in August 2011 and called for increases on every first Sunday in December, through 2015. This is the fifth and final of the approved hikes. The Port Authority says the money collected from the higher fares are paying for projects such as the Lincoln Tunnel Helix rehabilitation, the Bayonne Bridge roadway raising, the new Goethals Bridge, PATH improvements and completion of the World Trade Center. The Port Authority said th e$25.1 billion immediate 10-year capital plan will generate more than 131,000 jobs and was achieved by giving critical attention to safety, security and state-of-good-repair projects, including completion of the World Trade Center, while and phasing in other less immediate projects over more than 10 years.